The Great Glen Way is one of Scotland's Great Trails and follows the course of the Caledonian Canal through the Highlands from Fort William to Inverness over up to 79 miles (124km). The waymarked trail includes easy, level stretches, undulating forest tracks, lakeside paths and old drove and military roads as well as high-level alternatives for those looking for a greater challenge. Typically taking a week to walk, the route is an ideal introduction to long-distance walking. 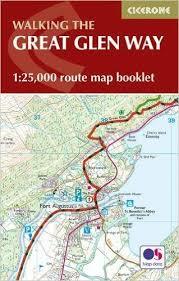 This booklet of Ordnance Survey 1:25,000 Explorer maps has been designed for convenient use on the trail. It shows the full and up-to-date line of the Way, along with the relevant extract from the OS Explorer map legend. It is conveniently sized for slipping into a jacket pocket or top of a rucksack and comes in a clear PVC sleeve. The companion guidebook - The Great Glen Way - describes the full route in both directions with lots of other practical and historical information.